If you have little to no video editing experience or don’t have access to editing software, the YouTube Video Editor is a perfect solution. This feature (honestly, did you know about this?) lets you edit your YouTube video from within the browser and gives you the options to combine video clips, add music, shorten clips, and add transitions. 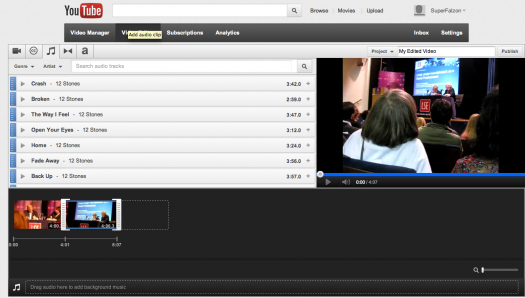 1 To use the Video Editor, you have to use videos that you’ve already uploaded to YouTube. Check out our how-to guides to learn how to upload a video to YouTube from your computer and how to upload a video to YouTube from your mobile phone. 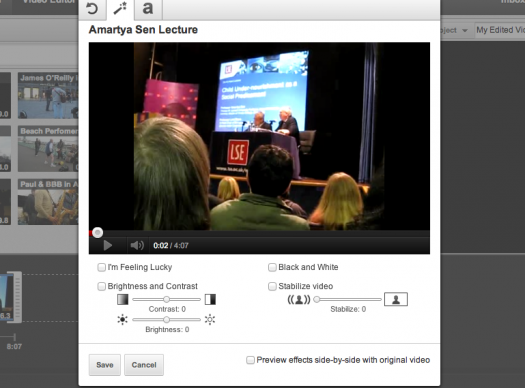 If you want to preview a video before selecting it for editing, mouse over the video and click the play button. 3Below the Media Picker is the Storyboard area. This is where you can drag and drop the videos that you want to edit. You can add up to seven videos to the Storyboard. 4To edit a clip, mouse over the video in the Storyboard and click on the scissors icon. 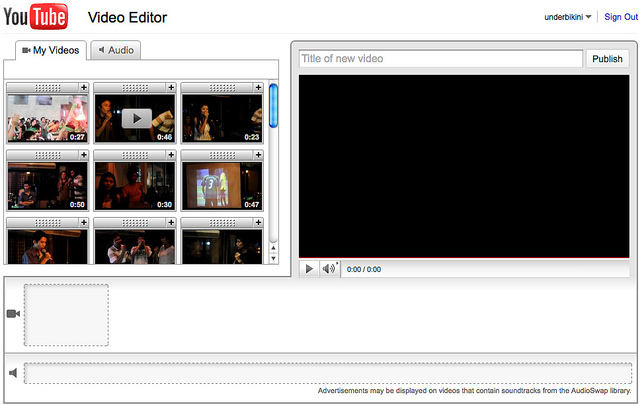 The Edit Clip dialog box will open. You can trim (shorten) a video by selecting new starting and ending points. Drag the “trimmers” (grey bars) on either side of the clip to your desired starting and ending points, and then click “Save.” You can preview your work at any time by hitting the play button. Note: You cannot split a clip, so if you want to use a different parts of the same clip, drag the video into the timeline multiple times and trim each clip down to the parts you want. 5To add effects, mouse over the video in the Storyboard and click on the wand icon. You can adjust the clip’s brightness and contrast and convert the clip into black and white. Click “Save” when you are finished. 6To add audio, click on the music note (audio) icon to find a list of music you can add to your video. YouTube has a pre-approved collection of music and you can search by genre or artist. Preview a song by clicking the play icon. Select a song by clicking the “+” icon. The song will then appear in the Storyboard. Unfortunately, you can only use one song per video. You can adjust the music’s volume level by sliding the bar toward the music note icon or the video camera icon. If you want to delete the music, click the “x” next to the slider bar. 7Add a title to your project in the upper right-hand side. When you are all finished, click “Publish” next to your project’s title. Your newly edited video will not replace your old video. It will create and publish a new video entirely. Brannon Cullum is a contributing writer for Movements.org, where this article first appeared. She completed her master’s degree in communication, culture and technology from Georgetown University, where her research focused on the use of mobile technologies in international development projects. Hey, this youtube tip looks awesome. I usually read this site when looking for advice on youtube video creation.